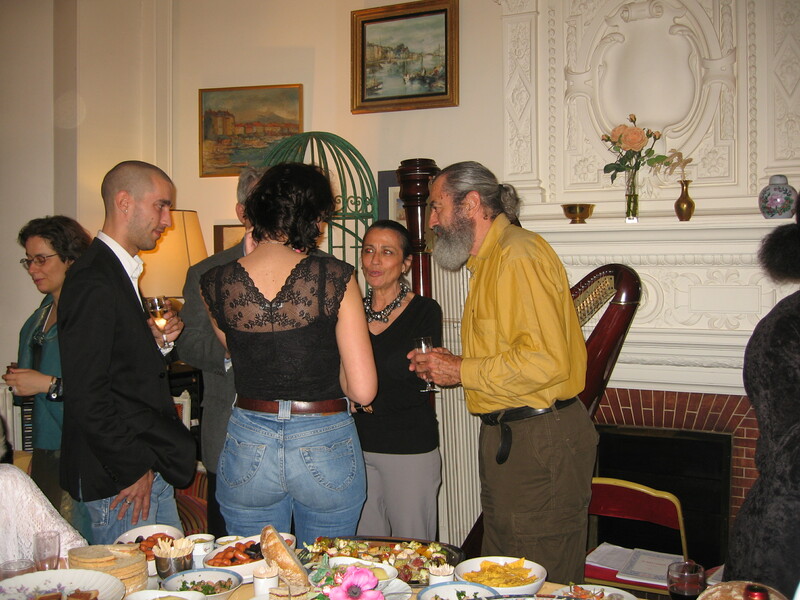 Mozart, Dvorak, Fauré, Tosti, Saint Saens, Jobim, those were the great composers on our musical menu for the first lyrical evening at the Opera Club de Paris Mario Lanza, on June 7, 2008. We wanted variety in the program : The Divine Mozart, with Papageno, from the Flute, french melodies by Gabriel Fauré, Biblical Hymns by Dvorak (in english), gospels, beautifully sung by Philippe Gaudin-Degaetz, a baritone voice full of depth and emotion (Philippe is a voice teacher and performer, and he is a Mario Lanza admirer and member of our Board). We were approximately seventy people, members of the Opera Club de Paris Mario Lanza and members of their families, and our audience of friends were enthusiastic about the program, the performance of the singers and the musicians (piano and harp). 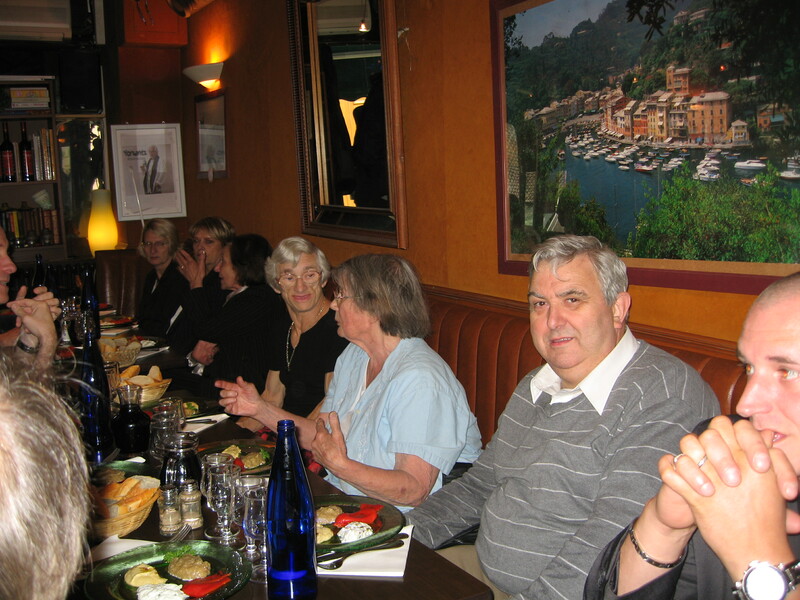 We started the evening by a party (Champagne and a very nice buffet) and a presentation of the Opera Club de Paris and Mario Lanza: the « lecture » was more pleasant with wine and champagne glasses and starters of all kinds, and people had the opportunity to mingle and talk with each other. After the real food, we had the spiritual food of music and singing and everyone was thrilled. Young Simon stood up and said : « For you and Mario Lanza, Simon is going to sing…Simon Boccanegra ! And he sang with maturity and a splendid bass voice ! People were just thrilled by the surprise as they had been enchanted by Philippe’s warm and vibrant voice (as well in french as in english and italian and german – Philippe was a professor of german language and litterature in a previous life ! -). 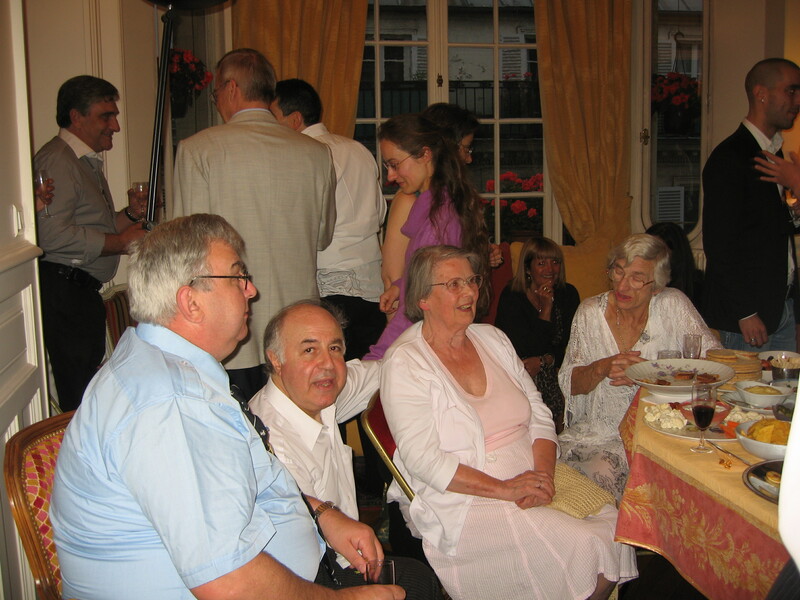 Picture: (from left to right): Brian Beacock, Marcel Azencot, Joan Marsden and Angla Moore. Angela Moore was founder and President of The Friends of Mario Lanza Fan Club in Rugby (England). In the morning we had held our first General meeting at nearby Yorgantz’s restaurant, and we appointed the members of the Board (most of them musicians, singers and voice teachers, and also including the Former Manager and Artistic Director of The Olympia Theater in Paris where Mario, already very sick, had sung a very short concert). We also dicussed a strategy, including having a yearly Paris Mario Lanza Singing Contest. Our British friends from Rugby (Angela Moore, Joan Marsden and Brian Beacock) joined us for lunch after the general meeting (Martin Yorgantz, the restaurant owner is a professional singer and had just returned from Moscow where he was invited to sing, and he knows and admires Mario Lanza, and has to or three Cd’s that I, once, gave him; so he puts on Mario’s voice during the dinners). That day, Martin sang for us (he’s got the whole equipment and music in the restaurant-). 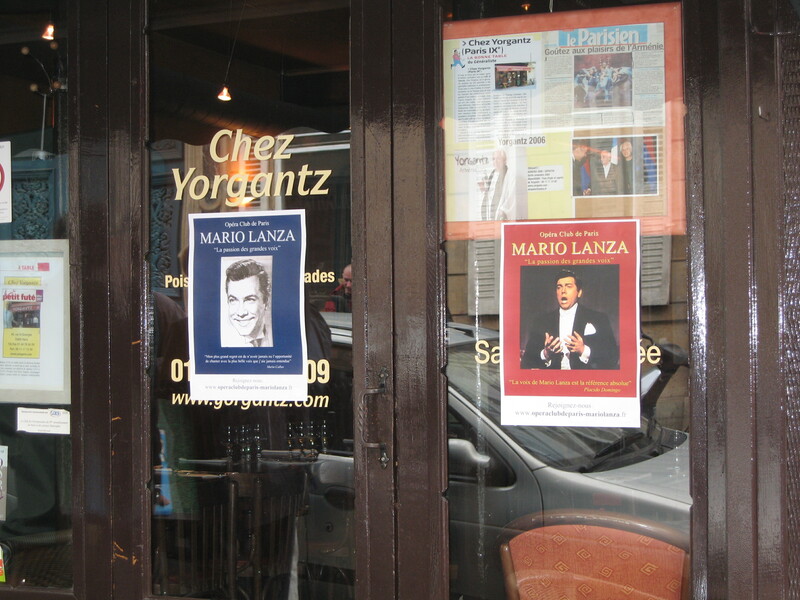 We had also displayed big Mario posters on the windows of the restaurant (splendid colour pictures of Mario in tux …) so that everybody in the street could stop and look at them and wonder what was going on in this popular restaurant in the neighbourhood. 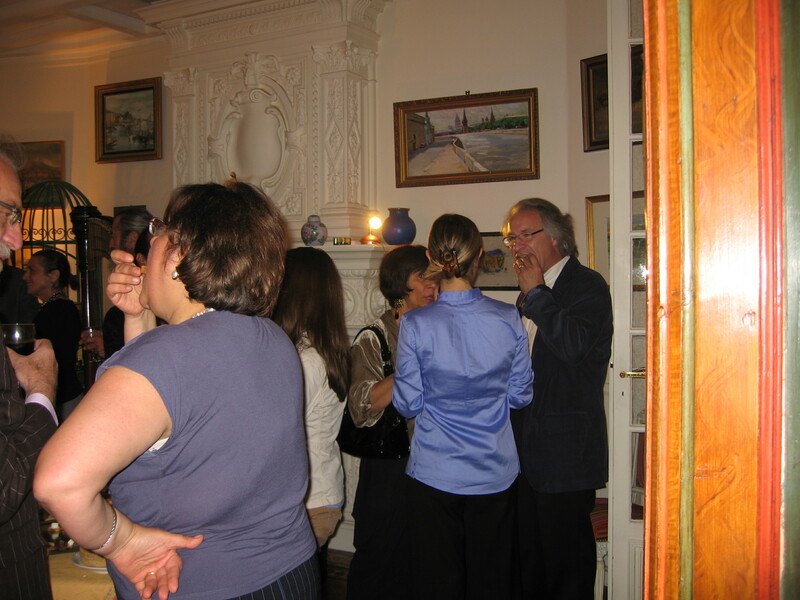 Of course our english friends were with us for the Concert and party, till 2 a.m at Michele and Marcel Azencot’s residence and we all shared friendship, warmth and emotion. We heard that it was Angela’s birthday and we disclosed the news to the audience, and the singers and the public joined to sing Happy Birthday in english and in french. And then, after desserts and pastries and Champagne again, we sat to listen to melodies by Tosti and magnificent brazilian songs by Jobim, all sweetness and love (Mario Lanza, who was a great cross-over artist would have liked to sing them). Philippe’s voice, who speaks brazilian too, was a treat. At the end of the program, Magella Bellanger, Emmanuel’s sister, played the harp for us (The Swan, by Saint Saens); it was like fresh water running from a spring. After the concert, we watched excerpts of Mario’s DVDs on the large black flat screen and listened to the « Addio alla Mamma« , from Mascagni’s Cavalleria Rusticana, « Un Di All’Azzuro Spazio » from Giordano’s André Chenier, and « The Lord’s Prayer » : after this prayer song, there was a great silence, everyone, believer or not, was impressed by the intensity of Mario’s faith and prayer and the pure beauty of the glorious voice and singing soul (« For Thine is the Kingdom,/ and the Power, /and the Glory, /For Ever,/ Amen !). I reminded the people that at the Hollywood Bowl, in 1949, under Eugene Ormandy’s orchestra direction, a young Mario Lanza suggested to the public that there’d be no applause, given « the essential dignity and beauty of the words« - always the respect for the words and their meaning -; his own words: »Such is the sacred nature of the song that I feel sure our listening audience would prefer that there’d be no applause at its conclusion »)*. I looked at Joan Marsden: her eyes were full of tears. Upon leaving, our British friends gave us a lot of Mario’s memorabilia (pictures, china items with Mario’s photos, the Rugby team Mario Lanza review etc…) but, most important, they shared with us love and affection and that’s exactly how everybody felt: people called us or wrote that they would not forget this first Opera Club de Paris private concert and that they were looking forward to another one. But if the performers and organizers could be credited for the music and the party, the credit of the heart was Mario Lanza’s blessed shadow and presence. * The concert at the Hollywood Bowl was recorded (Mario Lanza, The Hollywood Bowl, Historical Recordings, RCA VICTOR-SONY BMG).